Wins for the Blue Jays, the most in baseball. Errors by the Nationals, most in the majors, in 37 games. The Yankees’ record at home against the Twins since the start of the 2002 season. 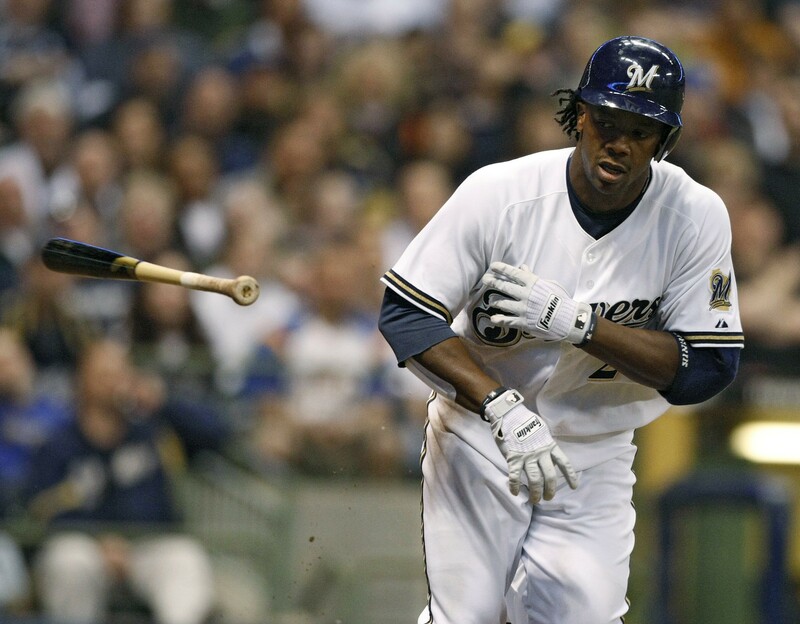 Milwaukee Brewers second baseman Rickie Weeks will miss the rest of the season because of a tear in his left wrist, a severe setback for the N.L. Central leaders. Weeks hurt himself while striking out Sunday in St. Louis. He had an MRI exam Monday in Arizona, and it revealed the injury. The Brewers said Weeks had a torn sheath in his left wrist and will likely have surgery this week. Recovery time is four to six months. General manager Doug Melvin said Craig Counsell will fill in at second base for Weeks for the time being. Ready to return from the disabled list, Yankees reliever Brian Bruney blamed an 81/2-minute wait during an umpires’ video review for causing a strained flexor muscle in his right elbow. Bruney went on the disabled list April 25, six days after he was warming up in the bullpen when umpires checked video before upholding a home run by teammate Jorge Posada. Mets slugger Carlos Delgado will have arthroscopic surgery today on his right hip, and there’s no immediate word on when he might return to the lineup. The Mets said Delgado has a bone spur and a torn labrum in his hip. Team spokesman Jay Horwitz said no timetable for Delgado’s return will be decided until after the operation. The team also placed reserve infielder Alex Cora on the 15-day disabled list with a torn ligament in his right thumb. The Cardinals hope center fielder Rick Ankiel and pitcher Chris Carpenter both can rejoin the team Wednesday. Ankiel bruised his right shoulder in a headfirst crash into the wall on May 4. He’s been playing in extended spring training games and is eligible to come off the disabled list Wednesday. Carpenter, the 2005 N.L. Cy Young winner, has been on the 15-day DL since April 15 because of a strained muscle in his left ribcage. Manager Mike Scioscia said slugger Vladimir Guerrero is on track to begin a short, minor league rehabilitation assignment Thursday or Friday and could be activated to return to the Angels’ lineup as soon as Memorial Day. The eight-time All-Star was placed on the 15-day disabled list April 18 with a torn right pectoral muscle. … Twins outfielder Delmon Young won’t rejoin the team until Friday at the earliest. Young left the team Friday to attend to his ill mother in California. … The Tigers say right-hander Juan Rincon has chosen free agency over an outright assignment. … The Reds say dizziness prompted first baseman Joey Votto to skip the team’s flight home from California and seek precautionary medical testing in San Diego.